As a teenager, Roger Brown wanted to chase the setting sun over the horizon. “I would look up into the sky and see airplanes, and I’d wonder where those people were going,” says Brown, reflecting on his upbringing in Accra, Ghana – “sweeping the compounds of his family home” and ruminating about life on the other side of the world. Now, the DeGroote Commerce alumnus and successful banking professional wants to help other students realize their own dreams – whether those dreams involve traveling abroad, landing a key internship, or competing against the top business schools in the country. That’s why he contributes to the DeGroote Experience Fund. The Fund was established to help Commerce and MBA students enhance their learning opportunities outside the classroom. Funding is available for national and international case competitions, conferences, leadership workshops, volunteer excursions and a wide variety of events. Last year, nearly $100,000 was distributed to student applicants, who were able to take part in valuable activities across Canada and beyond. The goal is to increase the Fund’s capacity to $200,000 over the next year. Brown knows every dollar counts – especially for international students. His own journey to DeGroote began in 2004, when, at the age of 17, he became the first member of his family to leave Ghana in pursuit of a post-secondary western education. After settling with a host family in Ancaster, Brown began attending Pre-University classes at Southern Ontario Collegiate in downtown Hamilton. His goal was to one day attend a Canadian university. McMaster was at the top of his list. Although admittedly shy during his first year on campus, he soon became a fixture in various student clubs and organizations. He got involved with the DeGroote Commerce Society, the DeGroote Finance Association and the International Relations Committee – “a platform for uniting international students at DeGroote,” he explains – among many other activities. While studying and making connections at DeGroote, Brown landed a coveted internship at State Street, serving as an Investment Manager Representative during the summer of 2008. He spent the next 11 months as a Sales Intern with RBC Dominion Securities, and graduated from the Faculty of Business in 2010. That’s when his career really took off. Today, he’s situated in the heart of Toronto’s Financial District. 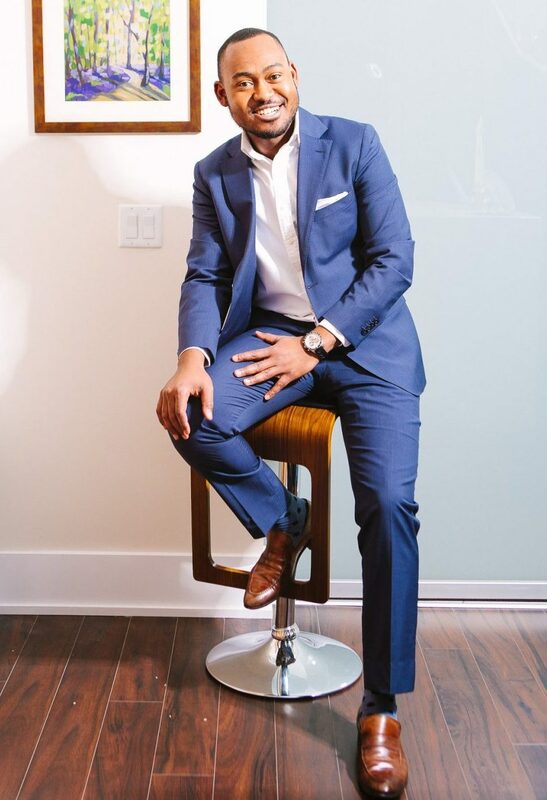 He’s currently a Relationship Manager in the Commercial Real Estate Banking division of Scotiabank – a company he’s been with for the past six years. For Brown, supporting the DeGroote Experience Fund is the perfect way to give something back to the school that helped launch his career. “You want to make sure the students at your alma mater are well positioned to enjoy the same kind of success,” he explains. Interested in supporting student activities by contributing to the DeGroote Experience Fund? Please contact Mark Stewart at mstewart@mcmaster.ca, or make a donation online.